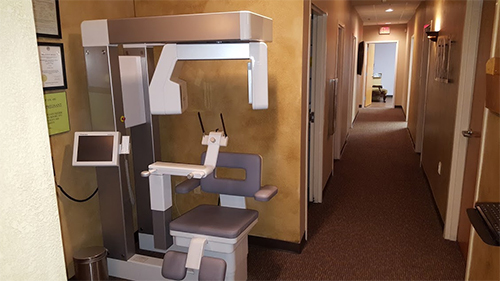 This system uses CT scans to generate a 3D, high definition x-ray of your entire oral cavity. The process is fast and the images are generated within seconds. The images we receive are large panoramic images that are remarkably clear, the high definition allows us to zoom in on trouble spots. This tool helps with diagnosing and treating a large variety of dental ailments. Together, we can assess your dental needs, treat the problem areas and allow you to continue enjoying your life in less time than you might expect. This system is far superior to that of traditional imaging equipment. What Can I Expect from the Cone Beam 3D Imaging System? • The ability to see in a large panoramic image the entire anatomy of the oral cavity. • With a full scope image, we can create a better, more effective treatment plan. • Determine the benefits and risk of varying treatment options. • A clear view of facial nerves and bone structure, which allows us to plan a customized procedure. • The use of considerably less radiation to obtain the necessary images, up to 10x less radiation exposure vs. traditional x-rays. • Quick, easy, instant scans (10-40 seconds to obtain an image). • Less expensive for the patient than the traditional film images used in the past. At Arrowhead Surgery, it is important that our patients receive the most advanced care possible. Dr. Allard works hard to stay constantly abreast of the latest information and technology to provide you with the best care. The 3D Cone Beam Imaging System provides an unmatched visualization of your anatomical detail, this aids in treatment and planning, and helps Dr. Allard explain the specifics based on your needs. We love this tool because it allows us an unmatched confidence in treatment planning, predictability and accuracy. Additionally, Dr. Allard is able to assess and predictably manage your pain and speed of healing.